The three charts below indicate that the Stock Market is not ready to crash, but as sentiment is surging we would not be surprised if the markets experienced a decent correction in the months to come. The Fed can’t allow this market to crash because the economic recovery is nothing but a bad joke. Ask any normal person and they will tell you that they know many individuals who have either stopped looking for a job or are working multiple jobs just to make ends meet. All the Fake numbers that the BLS (Bureau of Labour Statistics) issues are fraudulent in nature. For example, the so-called falling unemployment rate is nothing but one massive lie; the reason the unemployment rate is dropping is that the BLS does not count those individuals that stopped looking for work. We think the unemployment rate is probably north of 18%. However, shadow statistics put the unemployment rate close to 25% and that is far cry from the lying figure the Obama administration’s likes to tout. 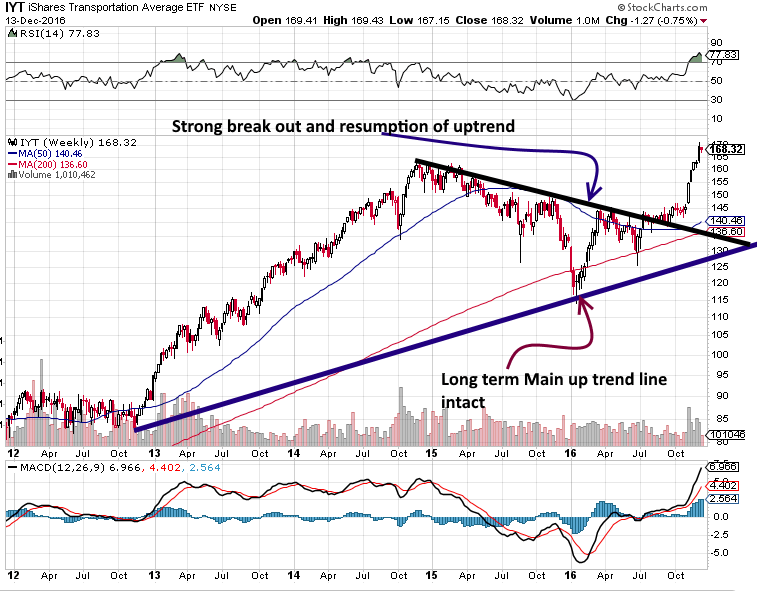 A quick look at the semiconductor index (above chart) illustrates that it is in a strong uptrend. It is trading above its main uptrend line and has continued to trade to new highs over the past five years. It could drop all the way to 650, and the outlook would remain bullish. IYT an ETF that mimics the Transports, after consolidating is trending upwards again and appears poised to challenge its old highs. A monthly close above 165 will pave the way for a test of the 195-205 ranges. 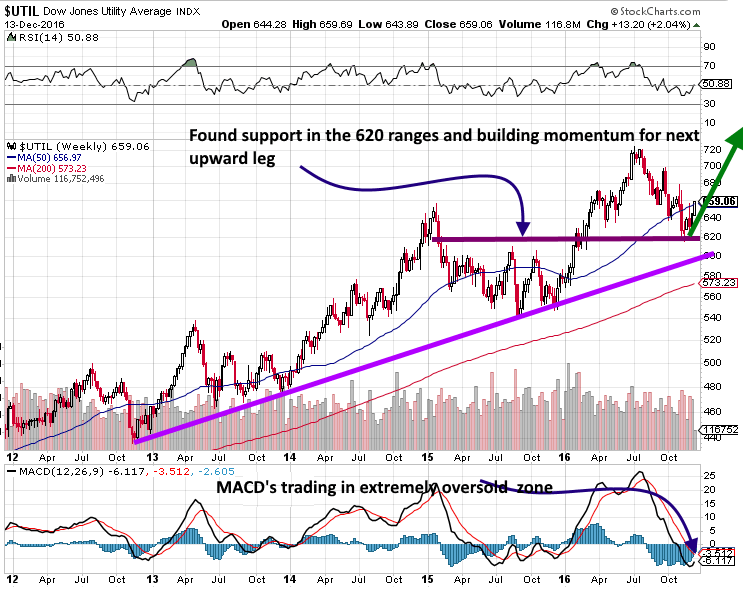 Finally, as we stated in the alternative Dow theory, the Utilities appear to be getting ready to trend higher. As they are coming out of a correction, they are likely to play around the 625-640 ranges for a bit before breaking out. The utilities lead the way up, so a breakout to new highs should be watched closely. If they break out to new highs, it would indicate that after a correction that could range from mild to strong, the Dow industrials should follow the same path. The illusion that the economy is doing well is supported because of the vibrant stock market. The stock market appears healthy because hot money is driving it. If the supply of hot money is cut, the markets tank and the illusion that all is well will come to screeching halt. If this economy were healthy, the Fed would have raised interest rates several times over the past ten years and not just twice. Moreover, Yellen’s statement that we posted at the onset of this article clearly indicates she is hedging her bets. You do not hedge your bets when you are sure of something. The bond market has not crashed; experts are confusing a rotation of money with a crash. Bonds were extremely overbought and had not experienced a strong correction for a very long time, so what’s taking place now is a healthy and well-deserved pullback. Regarding the Market, bullish sentiment has surged significantly, and the fact that some people are already starting to proclaim that the Dow could trade to 50,000 is reason for concern. Bonds are extremely oversold and are just begging for a reason to rally. A bond market rally will probably coincide with a short-term top in the markets. From a trading perspective, a nice healthy pullback will scare the masses away and provide the Dow with the energy to trade well past 20K. 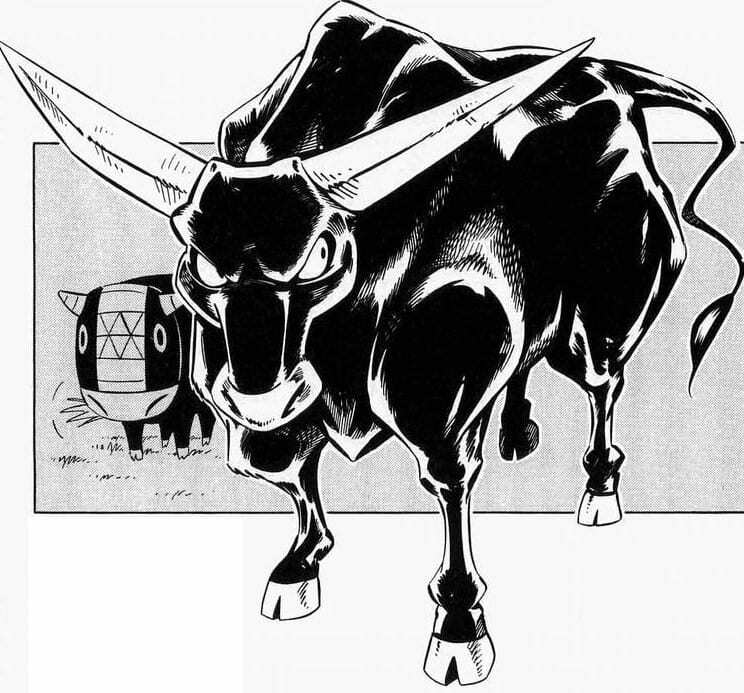 This bull is mature, so it should not come as a surprise if it decides to take a bit of nap before trending higher. Don’t confuse the subsequent correction for a crash; the naysayers will do their best to have you believe that the world is going to end.